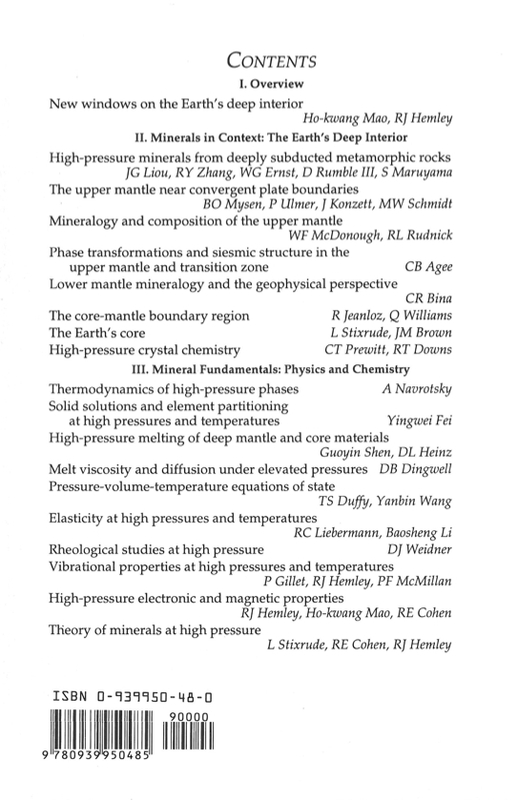 This volume was prepared for a short course by the same title, organized by Russell J. Hemley and Ho-kwang Mao and sponsored by the Mineralogical Society of America, December 4-6, 1998 on the campus of the University of California at Davis. High-pressure mineralogy has historically been a vital part of the geosciences, but it is only in the last few years that the field has emerged as a distinct discipline as a result of extraordinary recent developments in high-pressure techniques. The domain of mineralogy is now no less than the whole Earth, from the deep crust to the inner core-the entire range of pressures and temperatures under which the planet's constituents were formed or now exist. The primary goal of this field is to determine the physical and chemical properties of materials that underlie and control the structural and thermal state, processes, and evolution of the planet. New techniques that have come 'online' within the last couple of years make it possible to determine such properties under extreme pressures and temperatures with an accuracy and precision that rival measurements under ambient conditions. These investigations of the behavior of minerals under extreme conditions link the scale of electrons and nuclei with global processes of the Earth and other planets in the solar system. 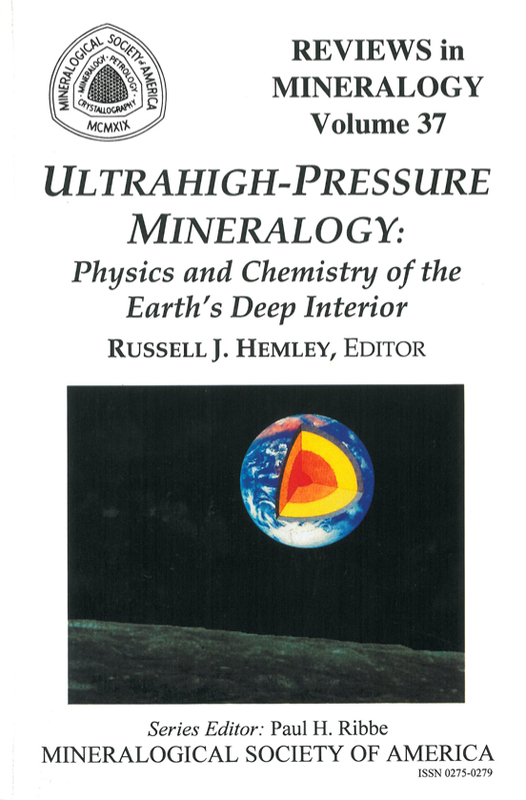 It is in this broad sense that the term 'Ultrahigh-Pressure Mineralogy' is used for the title of this volume of Reviews in Mineralogy. This volume sets out to summarize, in a tutorial fashion, knowledge in this rapidly developing area of physical science, the tools for obtaining that knowledge, and the prospects for future research. The book, divided into three sections, begins with an overview (Chapter 1) of the remarkable advances in the ability to subject minerals-not only as pristine single-crystal samples but also complex, natural mineral assemblages-to extreme pressure-temperature conditions in the laboratory. These advances parallel the development of an arsenal of analytical methods for measuring mineral behavior under those conditions. This sets the stage for section two (Chapters 2-8) which focuses on high-pressure minerals in their geological setting as a function of depth. This top-down approach begins with what we know from direct sampling of high-pressure minerals and rocks brought to the surface to detailed geophysical observations of the vast interior. The third section (Chapters 9-19) presents the material fundamentals, starting from properties of a chemical nature, such as crystal chemistry, thermochemistry, element partitioning, and melting, and moving toward the domain of mineral physics such as melt properties, equations of state, elasticity, rheology, vibrational dynamics, bonding, electronic structure, and magnetism. The Review thus moves from the complexity of rocks to their mineral components and finally to fundamental properties arising directly from the play of electrons and nuclei. The following themes crosscut its chapters. Our knowledge of the composition of the Earth in part is rooted in information on cosmochemical abundances of the elements and observations from the geological record. But an additional and essential part of this enterprise is the utilization of the growing information supplied by mineral physics and chemistry in detailed comparison with geophysical (e.g. seismological) observations for the bulk of the planet. There is now detailed information from a variety of sources concerning crust-mantle interactions in subduction (Liou et aI., Chapter 2; Mysen et aI., Chapter 3). Petrological, geochemical, and isotope studies indicate a mantle having significant lateral variability (McDonough and Rudnick, Chapter 4). The extent of chemical homogeneity versus layering with depth in the mantle, a question as old as the recognition of the mantle itself, is a first-order issue that threads its way throughout the book. Agee (Chapter 5) analyzes competing models in terms of mineral physics, focusing on the origin of seismic discontinuities in the upper mantle. Bina (Chapter 6) examines the constraints for the lower mantle, with particular emphasis given to the variation of the density and bulk sound velocity with depth through to the core-mantle boundary region (Jeanloz and Williams, Chapter 7). Stixrude and Brown (Chapter 8) examine bounds on the composition of the core. The advent of new techniques is raising questions of the mineralogy and composition of the deep Interior to a new level. As a result of recent advances in seismology, the depth-dependence of seismic velocities and acoustic discontinuities have been determined with high precision, lateral heterogeneities in the planet have been resolved, and directional anisotropy has been determined (Chapters 6 and 7). The first-order problem of constraining the composition and temperature as a function of depth alone is being redefined by high-resolution velocity determinations that define lateral chemical or thermal variations. As discussed by Liebermann and Li (Chapter 15), measurements of acoustic velocities can now be carried out simultaneously at pressures that are an order of magnitude higher, and at temperatures that are a factor of two higher, than those possible just a few years ago. The tools are in hand to extend such studies to related properties of silicate melts (Dingwell, Chapter 13). Remarkably, the solid inner core is elastically anisotropic (Chapter 8); with developments in computational methods, condensed-matter theory now provides robust and surprising predictions for this effect (Stixrude et aI., Chapter 19), and with very recent experimental advances, elasticity measurements of core material at core pressures can be performed directly (Chapters 1 and 15). The Earth is a dynamic planet: the rheological properties of minerals define the dynamic flow and texture of material within the Earth. Measurement of rheological properties at mantle pressures is a significant challenge that can now be addressed (Weidner, Chapter 16). Deviatoric stresses down to 0.1 GPa to pressures approaching 300 GPa can be quantified in high-pressure cells using synchrotron radiation (Chapter 1). The stress levels are an appropriate scale for understanding earthquake genesis, including the nature of earthquakes that occur at great depth in subducted slabs (deep-focus earthquakes) as these slabs travel through the Earth's mantle. Newly developed high-pressure, high-precision x-ray tools such as monochromatic radiation with modern detectors with short time resolution and employing long duration times are now possible with third-generation synchrotron sources to study the rheology of deep Earth materials under pressure (Chapter 1). One of the principal interactions between the Earth's interior and surface is subduction of lithosphere into the mantle, resulting in arc volcanoes, chemical heterogeneity in the mantle, as well as deep-focus earthquakes (Chapters 2 and 3). Among the key chemical processes associated with subduction is the role of water in the recycling process (Prewitt and Downs, Chapter 9), which at shallower levels is essential for understanding arc volcanism. Mass and energy transport processes govern global recycling of organic and inorganic materials, integration of these constituents in the Earth's interior, the evolution (chemically and physically) of descending slabs near convergent plate boundaries, and the fate of materials below and above the descending slab. Chapters 5 and 6 discuss the evidence for entrainment and passage of slabs through the 670 km discontinuity, and the possibility of remnant slabs in the anomalous D" region near the core-mantle boundary (Chapter 7). The ultimate fate of the materials cycled to such depths may affect interactions at the core-mantle boundary and may also hold clues to the initiation of diapiric rise. The evolution and fate of a subducting slab can now be addressed by experimental simulation of slab conditions, including in situ monitoring of a simulated slab in high-pressure apparatus in situ x-ray and spectroscopic techniques. The chemistry of volatiles changes appreciably under deep Earth conditions: they can be structurally bound under pressure (Prewitt and Downs, Chapter 9). Understanding pressure-induced changes in viscosity and other physical properties of melts is crucial for chemical differentiation processes ranging from models of the magma ocean in the Earth's early history to the formation of magmatic ore deposits. (Chapter 13). Recent evidence suggests that melting may take place at great depth in the mantle. Seismic observations of a low-velocity zone and seismic anisotropy at the base of the mantle have given rise to debate about the existence of regions of partial melt deep in the mantle (Chapter 7). Deep melting is also important for mantle convection from subduction of the lithosphere to the rising of hot mantle plumes. Very recent advances in determination of melting relations of mantle and core materials with laser-heating techniques are beginning to provide accurate constraints (Shen and Heinz, Chapter 12). Sometimes lost in the debate on melting curves is the fact that a decade ago, there simply were no data for most Earth materials, only guesses and (at best) approximate models. Moreover, it is now possible to carry out in situ melting studies on multi-component systems, including natural assemblages, to deep mantle conditions. These results address whether or not partial melting is responsible for the observed seismic anomalies at the base of the mantle and provide constraints for mantle convection models (Chapter 7). The composition, structure, formation, evolution, and current dynamic state of the Earth's core is an area of tremendous excitement (Chapter 8). The keys to understanding the available geophysical data are the material properties of liquid and crystalline iron under core conditions. New synchrotron-based methods and new developments in theory are being applied to determine all of the pertinent physical properties, and in conjunction with seismological and geodynamic data, to develop a full understanding of the core and its interactions with the mantle (Chapter 7). There has been considerable progress in determining the melting and phase relations of iron into the megabar range with new techniques (Chapter 12). Constraints are also obtained from theory (Chapter 19). These results feed into geophysical models for the outer and inner core flow, structural state, evolution, and the geodynamo. Moreover, there is remarkable evidence that the Earth's inner core rotates at a different rate than the rest of the Earth. This evidence in turn rests on the observation that the inner core is elastically anisotropic, a subject of current experimental and theoretical study from the standpoint of mineral physics, as described above. Whole Earth processes must be grounded in accurate thermodynamic descriptions of phase equilibria in multi-component systems, as discussed by Navrotsky (Chapter 10). New developments in this area include increasingly accurate equations of state (Duffy and Wang, Chapter 14) required for modeling of phase equilibria as well as for direct comparison with seismic density profiles through the planet. Recent developments in in situ vibrational spectroscopy and theoretical models provide a means for independently testing available thermochemical data and a means for extending those data to high pressures and temperatures (Gillet et aI., Chapter 17). Accurate determinations of crystal structures provide a basis for understanding thermochemical trends (Chapter 9). Systematics for understanding solid-solution behavior and element partitioning are now available, at least to the uppermost regions of the lower mantle (Fei, Chapter 11). New measurements for dense hydrous phases are beginning to provide answers to fundamental questions regarding their stability of hydrous phases in the mantle (Chapters 3 and 9) and the partitioning of hydrogen and oxygen between the mantle and core (Chapter 8). One of the key recent findings in high-pressure research is the remarkable effect of pressure on the chemistry of the elements, at conditions ranging from deep metamorphism of crustal minerals (Chapter 2) to "contact metamorphism" at the core-mantle boundary (Chapter 7). Pressure-induced changes in Earth materials represent forefront problems in condensed-matter physics. New crystal structures appear and the chemistry of volatiles changes (Chapter 9). Pressure-induced electronic transitions and magnetic collapse in transition metal ions strongly affect mineral properties and partitioning of major, minor, and trace elements (Chapter 11). Evidence for these transitions from experiment (Chapter 18) and theory (Chapter 19) is important for developing models for Earth formation and chemical differentiation. The conventional view of structurally and chemically complex minerals of the crust giving way to simple, close-packed structures of the deep mantle and a simple iron core is being replaced by a new chemical picture wherein dense silicates, oxides, and metals exhibit unusual electronic and magnetic properties and chemistry. In the end, this framework must dovetail with seismological observations indicating an interior of considerable regional variability, both radially and laterally depending on depth (e.g. Chapters 6 and 7). Information concerning the chemical and physical properties of Earth materials at high pressures and temperatures is being integrated with geophysical and geochemical data to create a more comprehensive global view of the state, processes, and history of the Earth. In particular, models of the Earth's interior are being developed that reflect the details contained in the seismic record but are bounded by laboratory information on the physics and chemistry of the constituent materials. Such "Reference Earth Models" includes the development of reference data sets and modeling codes. Tools that produce seismological profiles from hypothesized mineralogies (Chapters 4 and 5) are now possible, as are tools for testing these models against 'reference' seismological data sets (Chapter 6). These models incorporate the known properties of the Earth, such as crust and lithosphere structure, and thus have both an Earth-materials and seismological orientation. The Earth cannot be understood without considering the rest of the solar system. The terrestrial planets of our solar system share a common origin, and our understanding of the formation of the Earth is tied to our understanding of the formation of its terrestrial neighbors, particularly with respect to evaluating the roles of homogeneous and heterogeneous processes during accretion. As a result of recent developments in space exploration, as well as in the scope of future planetary missions, we have new geophysical and geochemical data for the other terrestrial planets. Models for the accretion history of the Earth can now be reevaluated in relation to this new data. Experiments on known Earth materials provide the thermodynamic data necessary to calculate the high-pressure mineralogy of model compositions for the interior of Mars and Venus. Notably, the outer planets have the same volatile components as the Earth, just different abundances. Studies of the outer planets provide both an additional perspective on our own planet as well as a vast area of opportunity for application of these newly developed experimental techniques (Chapter 1 and 17). The utility of synchrotron radiation techniques in mineralogy has exceeded the expectations of even the most optimistic. New spectroscopic methods developed for high-pressure mineralogy are now available for characterizing small samples from other types of experiments. For example, the same techniques developed for in situ studies at high pressures and temperatures are being used to investigate microscopic inclusions such as coesite in high-pressure metamorphic rocks (Chapter 2) and deep-mantle samples as inclusions in diamond (Chapter 3). With the availability of a new generation of synchrotron radiation sources (Chapter 1) and spectroscopic techniques (Chapter 17), a systematic application of new methods, including micro tomographic x-ray analysis of whole rock samples, is now becoming routinely possible. Contributions in technology. Finally, there are implications beyond the geosciences. Mineralogy has historically has led many to conceptual and technical developments used in other fields, including metallurgy and materials science, and the new area of ultrahigh pressure mineralogy continues this tradition. As pointed out in Chapter 1, many highpressure techniques have their origins in geoscience laboratories, and in many respects, geoscience leads development of high-pressure techniques in physics, chemistry, and materials science. New developments include the application of synthetic diamond for new classes of 'large-volume' high-pressure cells. Interestingly, information on diamond stability, including its metastable growth, feeds back directly on efforts to grow large diamonds for the next generation of such high-pressure devices (Chapter 1). Microanalytical techniques, such as micro-spectroscopy and x-ray diffraction, developed for high-pressure research are now used outside of this field of research as well. The study of minerals and mineral analogs under pressure is leading to new materials. As in the synthesis of diamond itself, these same scientific approaches promise the development of novel, technological materials.